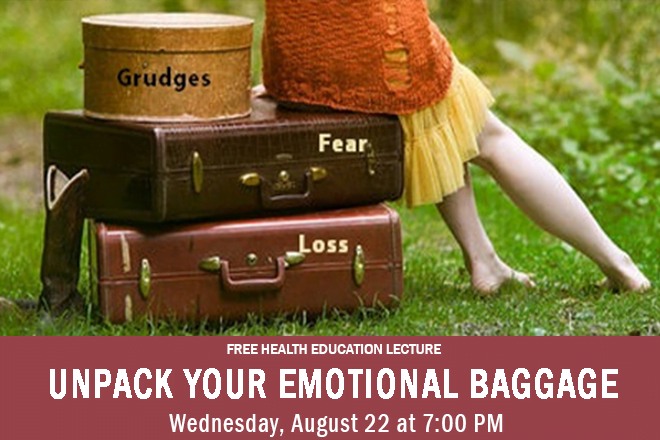 Attend a free health education class on Unpack Your Emotional Baggage on Wednesday, August 22, 2018 at 7:00 PM at the Roselle Center for Healing. This free health education lecture will be presented by Dr. Stephanie Pina, ND, LAc. Call 703-698-7117 to register by phone or register online here now. This free health education lecture is sponsored by Caring For Others, Ltd. When you make a donation at the health education event, you will receive a health consultation with an Associate Doctor at the Roselle Center for Healing. Please see presenting speaker or a front office staff member for complete details. Caring for others, Ltd. is recognized as a nonprofit charitable 501(c)(3) organization by the IRS.